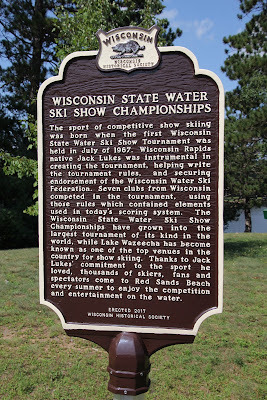 The sport of competitive show skiing was born when the first Wisconsin State Water Ski Show Tournament was held in July of 1967. 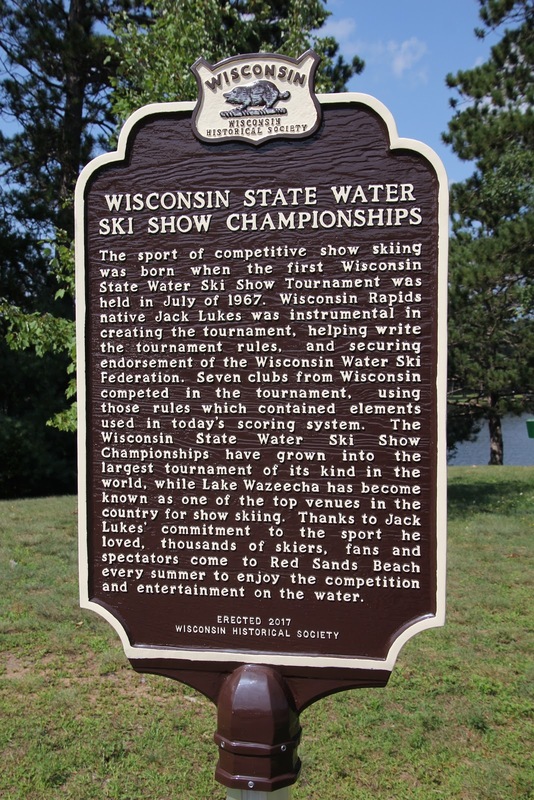 Wisconsin Rapids native Jack Lukes was instrumental in creating the tournament, helping write the tournament rules, and securing endorsement of the Wisconsin Water Ski Federation. Seven clubs from Wisconsin competed in the tournament, using those rules which contained elements used in today's scoring system. The Wisconsin State Water Ski Show Championships have grown into the largest tournament of its kind in the world, while Lake Wazeecha has become known as one of the top venues in the country for show skiing. Thanks to Jack Lukes' commitment to the sport he loved, thousands of skiers, fans and spectators come to Red Sands Beach every summer to enjoy the competition and entertainment on the water. 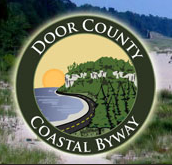 The marker is located adjacent to the parking lot at South Wood County Park, accessible from westbound South Park Road, between 72nd Street South (to the east) and 71st Street South (to the west, at or near 6411 South Park Road, Wisconsin Rapids, Wisconsin 54494. With Lake Wazeecha in the background. site at Red Beach in the distance. The marker is near the beach entrance. It's easy to miss the marker if the parking lot is full. The marker is located adjacent to the South Park parking lot.